After the establishment of the People’s Republic of China in 1949, the new people’s government centralized and monopolized disaster management by taking over republican disaster governance structures and incorporating charity and philanthropy organisations, such as the Chinese Red Cross, into state organisation. All foreign charities, which had been active in China since late Qing period, were driven out of the country or forced to cease working by 1958. In 1950 the Central Disaster Relief Committee was established with the task of coordinating disaster management efforts between government agencies and localities, but the Committee was abolished during the early stages of the Great Leap Forward famine (GLF), because it was regarded as unnecessary for the future communist society. Actual disaster management duties were divided among several government ministries and committees. The Internal Affairs Section of the Ministry of Internal Affairs (later renamed Ministry of Civil Affairs) was responsible for monitoring local famines, reporting them to higher authorities and administering famine relief efforts. It had offices down to county level, but it was a relatively weak agency, having only few dozen employees at provincial level per province. During the GLF famine, the local Internal Affairs Sections were even reduced in size and in urban context they handled mostly the refugee problem created by peasants fleeing the famine into cities. In the Maoist party-state, the most important player in disaster governance was the Communist Party. In hazard-stricken areas the local party committees always assumed the overall leadership in disaster governance by creating party leadership small groups and administrative headquarters to manage the crisis at hand on an ad hoc basis. The duty to implement the policies decided by leadership small groups was assigned through campaign headquarters to relevant government agencies, danweis (urban work units), and streets, and in the countryside to the counties and people’s communes. Maoist style disaster governance also expected high involvement of the population in the implementation of central and local disaster management decisions, usually in form of campaigns (yundong) to protect population from hazards, rescue and rebuilding tasks, with an explicit emphasis on local initiative and perseverance (zili-gengsheng). During the GLF famine especially the local grain, supplementary foodstuff (fushi meaning meat, fish, vegetables, etc. ), health, propaganda and public security authorities were important for urban famine management, and large mass campaigns to augment urban diets took place for example in form of vegetable growing and an ill-conceived pig raising drives. Even under such totalitarian disaster governance regime, obtaining local and individual compliance with policies was nevertheless difficult, since central policies often directly harmed communities’ and individuals’, interests, even chances of survival. Like Maoist disaster governance in general, famine governance came therefore with very active propaganda and disciplinary components aimed at generating popular compliance with party policies. A photo of people standing on top of unharvested grain in the “Sputnik” fields of autumn 1959. Source: Dangdai Zhongguo Tianjin, Vol 2. (Beijing: Zhongguo shehuikexue chubanshe, 1989), 113. Existing research literature on the GLF famine agrees that the famine was predominantly rural in its nature. This had at least two reasons. First, central and provincial governments prioritized urban centres, especially metropolitan cities, in the allocation of grain and other foodstuffs. Second, cities themselves resorted to various disaster management measures which prioritized holders of urban residence cards (hukou) over peasants in food allocation. Grain procurement and allocation had become a state monopoly in 1955 and supplementary foodstuff procurement and allocation was monopolized by local governments during the early stages of the GLF famine– often with notable difficulties. Because large cities could not usually procure enough grain or supplementary foodstuffs from their own suburban areas to feed their urban residents, provincial and central authorities who maintained state granary and grain distribution system allocated grain to cities from other parts of their provinces and the rest of the country. The largest cities, Beijing, Shanghai and Tianjin, were under direct central grain allocation system. Under this system, urban residents had stronger entitlements to food than rural residents, who were primarily responsible for feeding themselves after feeding city residents first. Urban residents’ grain rations, dingliang, depended on the type of their employment, age and whether one was a danwei or street resident. On average, urban grain dingliang in large cities was about 30 jin (15 kg) a month, but could go up to 66 jin for strenuous physical work. Cadres in the highest ranks of nomenclature had exclusive access to a special supply system, namely shops catering only to cadres. Food allocation was therefore unequal by design. By early 1959, the Great Leap Forward first created shortages of grain and other foodstuff deliveries to large cities when extra rations given to the steel production campaign participants depleted urban grain reserves and grain transports suffered from general chaos at railroads created by the Leap. Cities responded to the situation by starting to cut their residents’ grain rations and by mobilizing grain-saving campaigns, whereby residents and work units were encouraged and even forced though propaganda, peer-pressure and home searches and confiscations to hand in their private grain reserves to the state. At the same time, cities restricted outflows of food by setting strict limits to foodstuff that people could carry with them when leaving the cities and for example banning food shipments by mail. City authorities also mobilised ‘check and verify’ campaigns to inspect urban dwellers’ hukous, their work assessments and household situation in order to make sure food rations did not leak to wrong persons or outside urban areas. 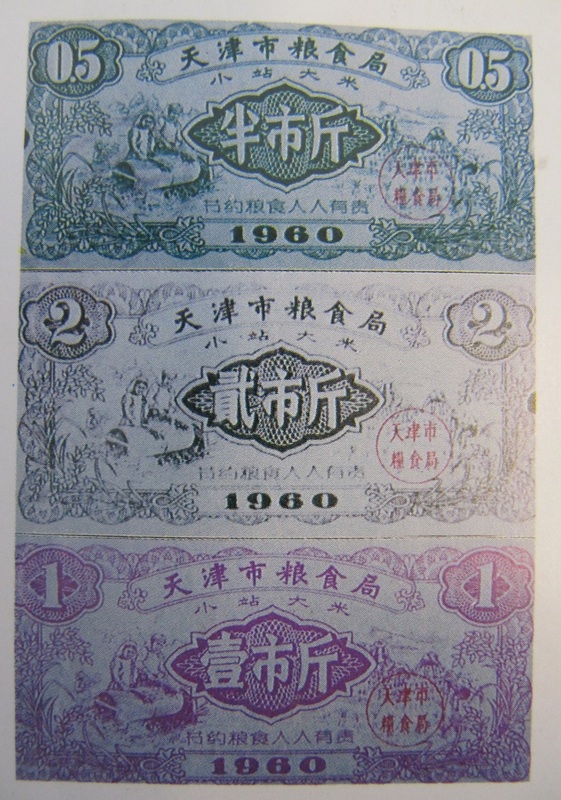 Tianjin City rice tickets from 1960. 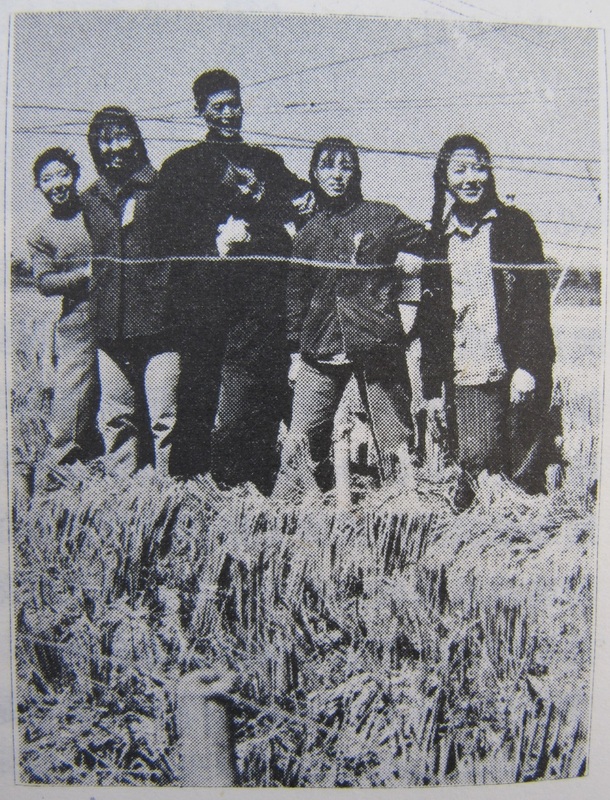 In the summer of 1959, large cities were told to start a campaign to increase their own vegetable production in their suburbs in order to compensate for grain shortages, but the campaign was not yet given priority in resource allocation, and was not followed through as the workforce planned for it was required to carry out the rekindled GLF production campaign after the Lushan conference in August 1959. At the same time, cities followed central orders and managed flash harvest campaigns in their countryside in order to collect grain away from peasants as quickly and thoroughly as possible. Cities also began to ‘augment’ food rations (usually by adding water to them) and use ersatz food instead of real grain. This could be anything from vegetable peals to, especially later, algae grown on urine. Already in 1959 large cities were receiving famine refugees from the countryside, although they were never officially recognized as such. Cities organised large reception and treatment (shourong) camps for the refugees. For example, during the GLF famine the Tianjin city shourong system handled 600 000 cases of ‘blindly migrating people’ (mangliu) as the famine refugees were euphemistically called. Thousands of such refugees nevertheless roamed city streets begging for food or looking for work. Before 1960 part of the refugees were hired to GLF-related construction jobs, but after August 1960 the standard became to handle each refugee’s case within one day of their arrival to shourong camps and repatriate them as quickly as possible. Already in 1959, cities began to organise sporadic health campaigns in their suburbs against mass poisonings and so called edema epidemics there. Mass poisonings were caused by peasants consuming inedible or poisonous wild vegetables as ersatz food to grain, which was an officially promoted policy since the spring of 1959. These relief campaigns tend to be short-lived and targeted only small parts of affected populations, who were ‘treated’ for example with noodles, sugar and other foodstuff in makeshift clinics. The length and amount or resources invested in such campaigns was usually far lower than the actual need was. At the same time countryside was told to serve the cities first with their food production and grain procurement was kept untenably high until August 1961. “A mechanized Chinese dinner”: a newsreel from 1961 as famine persisted across China..
Food rations in large cities were kept higher than peasants’ rations throughout the GLF famine, but with the constantly shrinking grain production the Party Centre had to issue special orders to grain producing provinces to ship their ‘surplus’ grain into large cities in summer of 1960. Large cities would send cadres to manage such grain shipments from famine-stricken areas. In autumn 1960 it became apparent that provinces were no longer able to provide cities with more grain, when central grain reserves were not growing during the autumn 1960 harvest period. Only this seems to have triggered central emergency measures to manage the famine for real both in urban and rural areas. However, before these measures could work, urban grain rations were cut in July and September and the Party Centre ordered intensifying the campaigns to increase vegetable and ersatz food production in cities. Now millions of urban residents were drafted to vegetable growing campaigns, taking land from suburban production brigades that were unable to cultivate them themselves. The campaign was complicated by the lack of seeds, expertise, and enthusiasm from urban danweis, whose other production targets had not yet been cut, and resulted only in a meagre growth in vegetable production in 1960. In autumn 1960 cities also began to suffer from a large edema epidemic. For example in Tianjin officially about one fourth of the population was diagnosed with edema – but diagnosis was often done by local party secretaries, not by medical doctors, who could be deemed politically unreliable for such a task. Following central orders, local authorities launched a large health campaign in urban and rural districts in November-December 1960. It consisted of establishing clinics for edema patients in all urban workunits. Patients were let to rest and their food rations were increased – if food was available. Cities also implemented policies to let people take rest during workdays in order to make their bodies burn fewer calories. Further, cities virtually stopped receiving any visitors and peasant refugees were sent home immediately after they were caught. In August 1960 the Party Centre also ordered downsizing urban workforce and sending it back to do agricultural work, which was carried out by city authorities in connection with the vegetable growing campaign. Cartoons from a Tianjin city daily depicting water control works and ‘abundant harvests in 1960’ despite famine conditions across China. Source: Tianjin ribao, November 24, 1960. The turn for the better in cities happened only when the central authorities allowed importing of foreign grain from Canada and Australia. The first shipment arrived in February 1961 in Tianjin Tangu Harbour. About 80 % of this grain went to feed cities, the rest to the countryside as relief aid. Cities had to lobby for their share of the grain, and the matter was decided in the end by Premier Zhou Enlai and Minister of Finance Li Xiannian, who received daily reports of the grain situation in large cities and cities lobbied for increased grain allocation actively. Grain rations were raised in large cities in spring of 1961 and the edema situation eased there, although cases did continue to occur throughout 1961. The vegetable growing campaign continued in 1961, when acreage and production figures rose notably. Growing their own vegetables and even grain became part of urban danweis regular activities. In general, the food situation stabilised in large cities by late 1961, but post-famine stabilisation measures, including importing foreign grain, the vegetable growing campaign and downsizing urban population continued long after this. Urban grain and foodstuff allocation was riddled with leaks and problems. Urban danweis tended to establish direct connections with suburban production brigades procuring their foodstuff directly from the producers bypassing the official procurement monopoly. Urban black markets grew visibly during the famine. Cadres took advantage of the special supply system ‘using the backdoor’. Theft and even murder for food were commonplace and food riots took place. Urban units would falsify numbers of their workers and their work attributes reporting light work assignments as strenuous physical ones in order to receive larger rations for their members. Households would not report their members who had died as deceased to city authorities in order to keep getting their rations. Counterfeiting ration tickets was widespread. City authorities tried to curb the situation by constant discipline campaigns including public executions of the biggest offenders with no major effect. 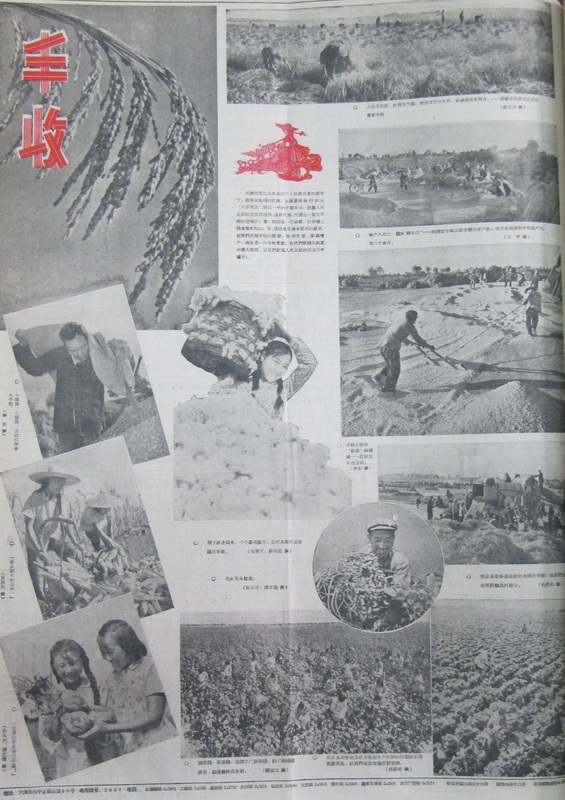 A propaganda spread from a Tianjin newspaper depicting abundant harvests in 1960. Source: Tianjin ribao, October 4, 1960. Deaths did go up also in large cities, although notably less than in the countryside. Based on official population statistics, for example in Tianjin City the average mortality rose by 1.21 ‰ compared to the pre-GLF three-year average, which would indicate about 4000 excess deaths of urban hukou-holders over 1959-1961, but the accuracy of statistics can be questioned. Most vulnerable of the urban-hukou holders were elder street residents living alone, the sick, and the official outcast of the Maoist system, those labelled with ‘bad’ class background. Best protected were party cadres who had a special supply system to rely on, but also the police, propaganda workers and intellectuals had special subsidies in their rations, indicating party-state priorities during the crisis. A workplace in an urban danwei also offered protection against the famine, as attemps were made to keep their grain supplies constant. Lauri Paltemaa is professor of East Asian politics and director of the Center for East Asian Studies at the University of Turku, Finland. Campaigns as the distinct method in Maoist governance are explained by Bennett 1976. Major English language studies on the GLF famine include Dikötter 2010; Becker 1996; Yang Jisheng 2012; Dali L. Yang 1996; Kimberley Ens Manning and Felix Wemheuer 2011; and Thaxton 2008. 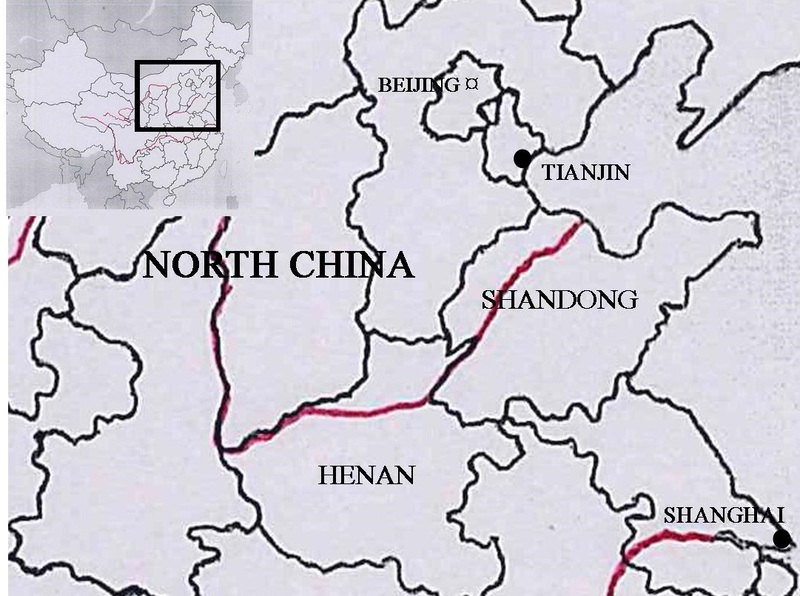 ‘Zhong-Gong zhongyang guanyu zai da-zhong chengshi fazhan fushipin shengchande zhishi (1)’ [The Party Centre of the Chinese Communist Party Instructions on Developing Supplementary Food Production in Big and Middle-sized Cities’ Suburban Districts (1)], in Jianguo yilai zhongyao wenxian xuanbian vol. 11 [The Anthology of Important Documents since the Founding of the PRC] (4 July 1959). The Database of the CPC, [accessed 3 October 2013], URL: http://58.68.145.22/directLogin.do?target=cpc. The above section draws on Paltemaa (2015, chapter 1). See also Yang Jisheng 2012, 216-219 on such campaigns. See Brown 2011 for more on this. Chen, Gang (2012). China’s Management of Natural Disasters – Organizations and Norms, in Jae Ho Chung (ed. ): China’s Crisis Management. London:Routledge 2012 (3rd ed. ), 130-148. Yang, Dali L. (1996). Calamity and Reform in China – State, Rural Society, and Institutional Change since the Great Leap Famine. Stanford: Stanford University Press.